Kids under the age of 12 are free! Cancellation Policy: I will reschedule all trips to available dates, I will refund all deposit money prior to 14 days of scheduled date. Will not refund deposit money if less than 14 days notice of scheduled date. I will supply all rods, reels, tackle, bait, gas, lunch and non-alcoholic drinks. The food that I provide includes cold cuts, cheese and bread for sandwiches with condiments (mayo, mustard). Also provided are chips, cookies, snack meats. The drinks include bottled water and 4 or 5 different soda pops. At the end of the day, I will clean and package your fish so they are ready for the freezer. Items not included are: fishing license, Montana State Parks season or day pass, lodging, gratuity or personal items. Personal items that you may want to bring include rain gear, camera and sunscreen. Fishing trips originate at Hell Creek State Park, in Hell Creek State Park, 26 miles north of Jordan. 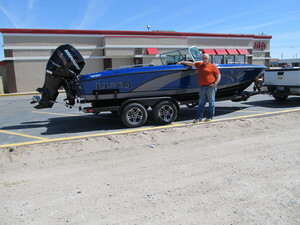 We will meet at the Hell Creek boat ramp. Time of departure is as early as you would like, usually 6 a.m., however we can depart as early as the client would like. We will fish at least eight hours, and probably more weather permitting. 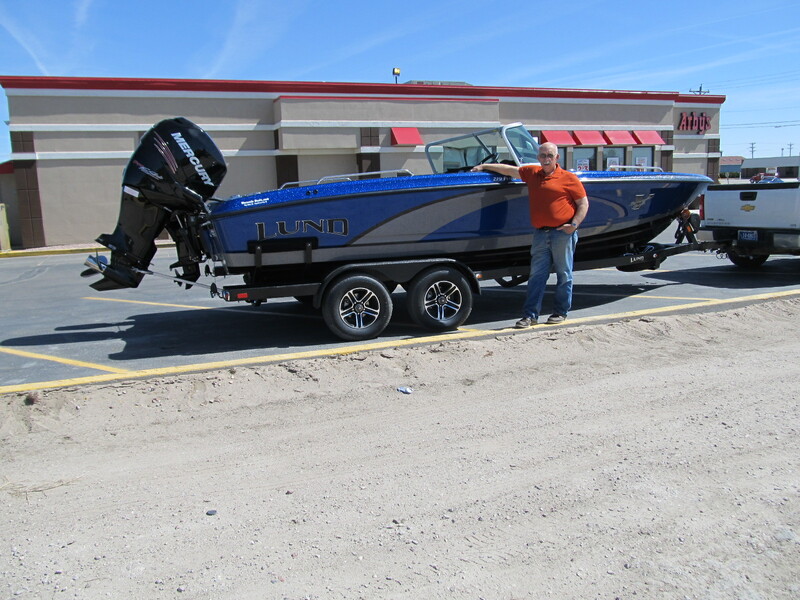 With my 21′ 9″ Lund boat and 300-horsepower Mercury outboard, there are plenty of options for places to go. Once we get to the fishing spot, we’ll either troll with my 15-horsepower Mercury kicker motor or with my MinnKota I-Pilot link electric trolling motor. Fishing tactics vary with the time of the year, the depth and species of the fish we’re after and water temperature which helps determine how active the fish might be. I personally practice selective harvest but I will not force these values on my clients. Once you catch a fish, the choice as to release it, or keep it to put it on the wall, or to eat it — it’s your choice. Most people do not get to fish as often as they would like, travel great distances, and pay a lot of money to catch a nice fish or several fish. 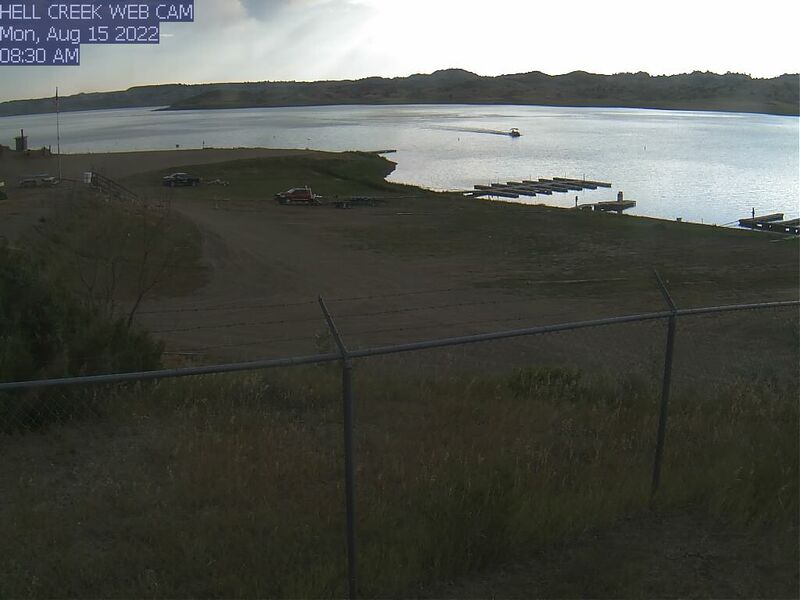 The Fort Peck fishery has several age classes of walleye with a number of big fish in the older age classes. This walleye fishery is supplemented heavily by stocking and the loss of a few big walleyes will not affect production. When the fishing day is done, your fish will be cleaned and bagged at the fish cleaning station at Hell Creek State Park for you to take home or cook them. Accommodations in the area include the Garfield Motel (406-557-6215) or Fellman’s Motel (406-557-2209) in Jordan, motel units at the Hell Creek Marina (406-557-2345) or you can camp at Hell Creek State Park. The State Park offers running water, flush toilets, shower facilities, fish cleaning station, kids play area and an RV dump station. There are RV plug-ins for electricity. For more information on Hell Creek State Park, you can go to the Montana Fish, Wildlife and Parks Web site by clicking on: Hell Creek State Park info. When you book your trip with me, you can either send us a check with your 50% deposit or, if it’s more convenient for you, click on the buttons below and use your credit card to pay Online through PayPal. With PayPal, they do charge us a transaction fee, which will show up as a handling charge on the PaPal form.